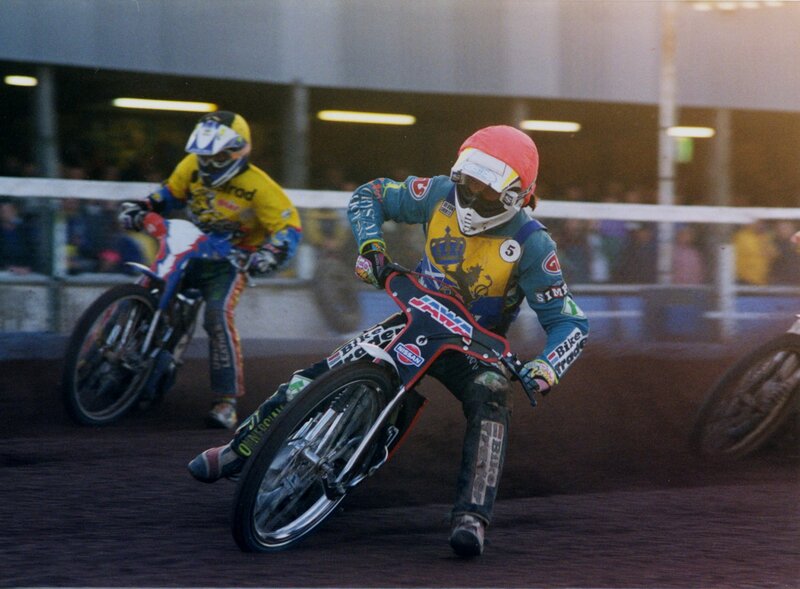 Our original choice for 1997 third heat leader Stefano Alfonso missed out because of a minor drugs misdemeanour, and subsequent signing Jarno Kosonen proved too weak for the role. A phone call to John Perrin (making an enquiry about Richie Musson) brought the suggestion "Why don't you try Peter Carr?" He had started racing again after almost two years out, and surprisingly agreed to make the trip north. His debut came on 9th May at home to Sheffield, using bike and leathers borrowed from Steve Johnston. He fell in his first race, he fell in his second race (though he had impressed in both), then he won his next three. This photo is heat 13, and of course.... the rest is history.